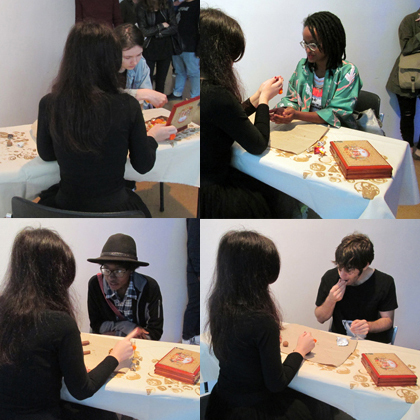 BEATRIZ ALBUQUERQUE - Performance, 2018, Predict the Future through Chocolate, Center for Performance Research, New York - USA. - Material 1 burned tablecloth, 33 chocolates, 4 ceramic sculptures (chocolates), 1 3D printed ring, 1 3D burned wood box, 1 table and 2 chairs. - Place of event 2018, Center for Performance Research, New York - USA. In "Predict the Future through Chocolate", Beatriz Albuquerque presents this interactive performance in an intimate and informal context, this performance will invite everyone from the audience to learn about the future through the reading of the chocolates by the shaman Beatriz Albuquerque. The chocolates will be thrown like dice. It will be up to the public to believe it or not!